The Mobile Warehouse Picking module is installed on top of the Mobile Warehouse module. This module adds a new window type to manage Picking Lists using Outbound locations. In this new window users can access the picking lists that are assigned to them. On each picking list they can confirm that each required item is moved to the outgoing location. It is also possible to manage incidences. As explained in the Mobile Warehouse User Guide it is necessary to create a new record in the Mobile Warehouse Menu window. Set the window type Picking List in your record to access the pickings. Log into the Warehouse Mobile application and tap on the menu entry previously created. This opens the Picking List window. Tapping on the * button opens the Picking List chooser. In the chooser all the Outbound Picking Lists that are assigned to the user and not in Done status appear. When a Picking List is selected the chooser closes and all its items are loaded in the window. The items are grouped by origin storage bin. The header shows the identifier of the selected picking list and the Outbound locator where the goods must be left once the picking is done. Each item shows a check sign, the product name and attributes when needed, the quantity needed to pick and the actual picked quantity. Tapping on the check sign will update the picked quantity to the total needed quantity. While tapping on the picked quantity increases it by 1 unit. when the picked quantity is the needed quantity the item is ready to confirm, the check sign changes to green and the Done button is enabled. 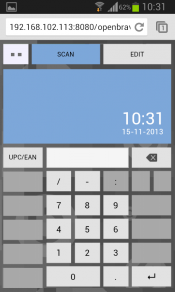 Enter a number and press the Enter key sets that number as picked quantity. Enter a number and press the + or – keys increased or decreases that number to the picked quantity. Press the + or – keys without any number in the keypad increases or decreases the picked quantity by 1 unit. When the right panel is in Scan mode it is possible to scan or manually enter the bar-code of the product that is picked. 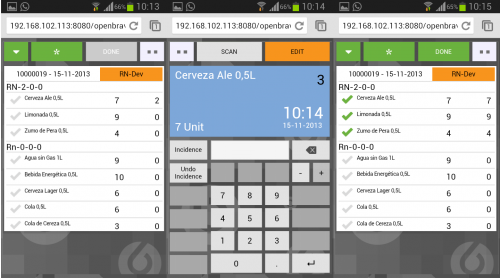 When a product is scanned the application searches the items list and its picked quantity is increased by 1 unit. In case the product is more than 1 item the first one that is found with some quantity pending to pick is updated. This can happen when it is required to pick different attributes of a single product or the product is picked from different storage bins. All the changes done in the picking list are not persisted until they are confirmed. To do so the button Done needs to be tapped. This opens a confirmation message and confirms all the items that are ready. When the process is finished the item list is reloaded to show the new statuses. Note that if there are items that are not completely picked their picked quantity will be reset to zero. So do not confirm any picklist item if you do not want to loose those quantities. In the prior image the operator has picked all the items from the RN-2-0-0. They are Ready so the check sign is green and the Done button is enabled. Before moving to the next storage bin the operator press the Done to persist in the back-end that those items are confirmed. All confirmed items are loaded with a light green background and cannot be selected or edited. Instead of the picked quantity a text with the status is shown. When there an issue and the operator cannot pick the required products an incidence on the corresponding item is raised. This can be done from the right panel. When an item is selected in Edit mode there are 2 buttons to raise and reset incidences. The incidence button raises the incidence. The item and its picking list in the back-end are updated to Incidence status. The item in the mobile window is updated with the new status. In this case the item is shown with a light orange background and instead of picked quantity the status is shown. 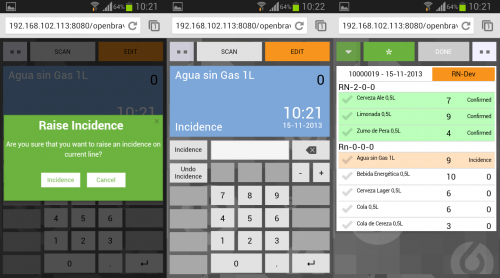 Tapping on undo incidence the incidence is reset in the back-end and the item is updated to pending status. 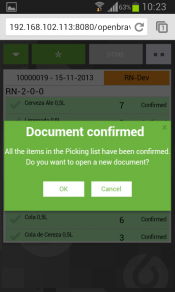 When all the items are confirmed the Picking List status is changed to All Confirmed and a Document Confirmed message is shown. 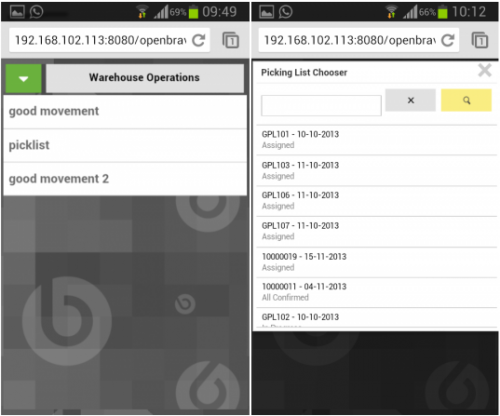 Tapping OK the user is redirected to the Warehouse Operations menu to start with a new Picking List. In order to set automatically Picking List status from All Confirmed to Closed a preference Picking List Auto Close with default value N is available in Picking List Module. 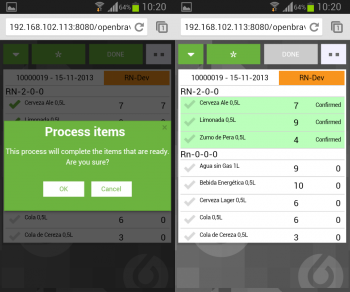 Mobile Picking Module users could enable this preference to automatically close picking when all lines are confirmed.